Lake Saint Clair is one of the best fisheries in the state of Michigan. The lake has a world class musky and smallmouth bass population along with good numbers of panfish and perch. Walleye, pike, largemouth bass and catfish can also be caught on the 5,000 acre lake. The fishing on Lake Saint Clair is best done from a boat but an angler can also experience success from shore. Before purchasing my boat, I fished Lake Saint Clair from shore often and brought home quite a few meals. The key to shore fishing Lake Saint Clair is to key in on the prime months and to not waste your time when the fish have moved out to deeper water. I would shore fish Lake Saint Clair every weekend from ice-out until around June 1st. During these months, the fish are close to shore and accessible to shore fisherman. The fish spawn after ice-out in the canals and then hang out in the shallows feeding on bait-fish. Once the water warms, they move to deeper water to find cooler temps. I would first target bluegill and perch and then mix in smallmouth once the catch and release season started. Areas I keyed in on were public access spots that had a canal leading into the main lake or boat docks. One of the challenges of shore fishing Lake Saint Clair is finding drop-offs that fish key in on or deeper water in general. Canals are prime spots because they have been dredged out to accommodate bigger boats. They are man-made drop-offs that are deeper than the surrounding area and usually hold fish. Fish concentrate around boat docks for some of the same reasons as canals. Like canals, they have deeper water plus they have structure that fish will relate to. My favorite spot to shore fish Lake Saint Clair was the library in Saint Clair Shores. The library has a pier set up for shore fisherman along the main lake plus a marina with boat slips. I would fish the boat slips right after ice-out for perch and gills and then the pier once the spawn was over. My favorite spot was all the way down the pier where the canal entered the main lake. I don't know how many fish I pulled out from that spot but I rarely came home with a skunk. Keep in mind, this spot is for residents of Saint Clair Shores only but the same lay-out can be found all over the lake. The library was not my only go to spot. I have had luck shore fishing at the nine mile pier for smallmouth right after the catch and release season started. If you time it right, the fish are close to shore for a week or two and the action can be just as good as in a boat. Try throwing a half ounce jig and a tube for smallmouth. An occasional bonus walleye can be caught here in the early morning or right at dark as well. Another shore fishing spot for early season smallmouth and the occasional walleye is the Grosse Pointe Park at the south end of Saint Clair Shores. However, this park is for residents of Grosse Pointe only and access is limited. If you live in Grosse Pointe or know somebody, I have heard of anglers catching 20 plus smallmouth in a day plus walleye and jumbo perch. Another early Lake Saint Clair shore fishing hot-spot that can be accessed by all is Metro Park at sixteen mile. The park has a couple different spots anglers can access and fish can usually be found in one of them. Depending on the time of year, I have had success at all of the different spots. 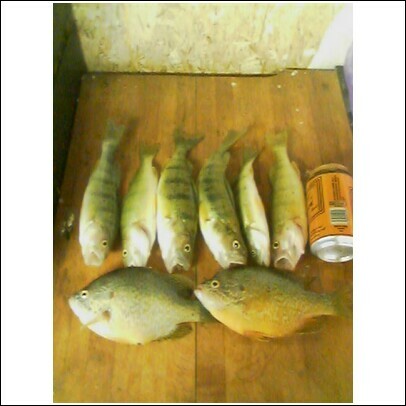 The boat docks and marsh area are both good early on for perch and gills. After the spawn, the fishing is better on the main lake where the river enters the lake. I would drag a perch rig with a worm on the bottom hook and minnow hooked to the top for perch and gills. A tube or mister twister attached to a half ounce jig works best for bass. These are just some of the locations I have had success in the past but there are many more. I have fished Brandenburg park in Chesterfield, the Selfridge DNR launch, even off the side of the road in Fairhaven. These are all popular spots for shore-fishing and can be hot at times. If you haven't had luck shore fishing Lake Saint Clair in the past, try some of these spots out. Once you figure out what you are looking for, get on Google maps and try to find some honey holes of your own. You might be surprised what a little research will get ya. Sounds like a great lake to fish. In the lakes around here, you would be lucky to catch that many fish from shore. I recommend you try ultralight fishing, if you don't already. It will increase the excitement of catch smaller fish like panfish. Anyways, Thanks for the comment on my blog. ultralight fishing for panfish is the only way to go... hauling in a nice bluegill on 2 pound test never gets old.